Ken Bredemeier | VOA Sep 4, 2018. The U.S. Supreme Court confirmation hearing of Brett Kavanaugh got off to a rocky start Tuesday, with demonstrators shouting against his appointment and minority Democrats losing a bid to delay the proceedings until thousands of pages of documents about Kavanaugh’s past work at the White House are made public. Democratic lawmakers complained that White House officials under President Donald Trump are withholding the documents from the early 2000s when Kavanaugh served as a staff secretary to former Republican President George W. Bush. Democratic senators say they want to use the material to inform their questioning of the 53-year-old appellate court judge. “I appeal to your sense of decency and fairness,” Democratic Sen. Cory Booker of New Jersey told Senate Judiciary Committee Chairman Charles Grassley in asking for a vote on a delay. But the Iowa Republican rejected as out of order Booker’s call, along with other Democratic senators, for any vote on whether to postpone the hearings until more documents are disclosed. Grassley said more documents about Kavanaugh’s career in Washington are already available than for past Supreme Court nominees, along with 300 decisions he has written as a judge on the U.S. Court of Appeals in Washington. After rejecting a hearing delay, Grassley offered his own opening statement as security officials ejected more demonstrators. The Judiciary Committee has received 415,000 pages of documents about the Supreme Court nominee’s time in the Bush White House, of which 147,000 are being withheld from public release. In addition, Trump officials said they would not release 101,921 pages of Kavanaugh-related records to the panel because of the sensitivity of the communications. It turned over 42,000 pages on Monday night. Kavanaugh introduced his family at the packed hearing room, but otherwise sat silent as Democrats unsuccessfully sought the delay. In advance of the hearing, the White House released some of Kavanaugh’s opening statement he plans to make, in which he declared he would be an unbiased referee in deciding cases on the country’s highest court. “A good judge must be an umpire — a neutral and impartial arbiter who favors no litigant or policy,” Kavanaugh said. Íf confirmed by the Senate, Kavanaugh would replace retired Justice Anthony Kennedy, a moderate conservative who was a swing vote on the court, siding with its four liberals in key 5-4 rulings upholding abortion and gay rights and affirmative action to increase university admissions for racial minorities. But independent court analysts believe Kavanaugh’s rulings on the federal appeals court in Washington indicate he would tilt the high court’s ideological balance toward conservative rulings for years to come. 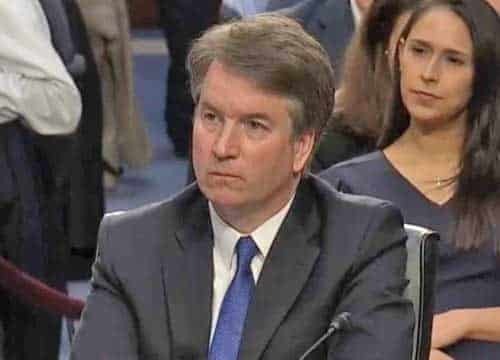 Kavanaugh is expected to face tough questioning by the Judiciary panel, especially from Democratic lawmakers, on how he would decide new abortion and gay rights legal challenges, as well as the extent of the power of special counsel Robert Mueller to investigate whether Trump obstructed justice by trying to thwart the criminal investigation into Russian meddling in the 2016 U.S. presidential election. But Kavanaugh appears headed toward eventual confirmation by the full Senate. Republicans hold a 50-49 edge in the chamber, soon to increase to 51-49 when a Republican is named to replace the late Sen. John McCain. No Republican has said they will vote against Kavanaugh, nor has any Democrat said they will vote for him, although a handful of Democratic lawmakers might eventually support his confirmation. He praised Kennedy, for whom he once served as a law clerk. The proceedings, which could last for days, are starting with opening statements by the committee members and eventually Kavanaugh’s remarks. On Wednesday, Kavanaugh is due to face direct questioning on a range of issues, including his stance on abortion, gay rights and presidential powers. Recent Supreme Court nominees have refused to say how they would rule in specific cases, but, under questioning, have discussed their judicial philosophy, giving a hint of how they would rule on controversial issues. The White House is hoping the full Senate will confirm Kavanaugh this month, in time for him to fill the vacancy left by Kennedy’s retirement when the court opens a new term on October 1. However, Democrats have vowed to fight Kavanaugh’s nomination from the start, fearing his lifetime appointment could ensure a strongly conservative court for a generation. Democrats will likely try to portray Kavanaugh as someone too tied to Trump and who will push a conservative agenda on the high court. Republicans are expected to try to paint the nominee as an independent thinker and a principled jurist. One of the main issues Kavanaugh will be questioned on is the Supreme Court’s landmark 1973 Roe v. Wade case, which gave women the right to have an abortion. Kavanaugh, who has championed pro-life views, has not said whether he believes the case was decided correctly, and he is not likely to do so during the hearings. Another key issue at the hearings will be Kavanaugh’s views on executive authority. Kavanaugh has argued that presidents should be free from civil lawsuits, criminal prosecutions and investigations while in office. His view was shaped by his own involvement with a presidential investigation when he worked for independent counsel Ken Starr in his investigation of President Bill Clinton in the late 1990s. The matter could be significant to Trump if the high court is called upon to render judgment on matters arising from special counsel Mueller’s ongoing Russia-related investigation into the Trump administration and several civil lawsuits pending against Trump. Kavanaugh will also likely face tough questioning on environmental controls, affirmative action and the conflict between religious beliefs and gay rights. Randy Barnett, a constitutional law professor at Georgetown University, told VOA it will not be clear exactly how Kavanaugh would rule on certain issues, and that he thinks it is right to not have those positions spelled out in advance. Kavanaugh’s record of court opinions shows he is a conservative thinker opposed to abortion and supportive of corporations against government regulation. He is a Catholic who has the backing of evangelical Christian groups.